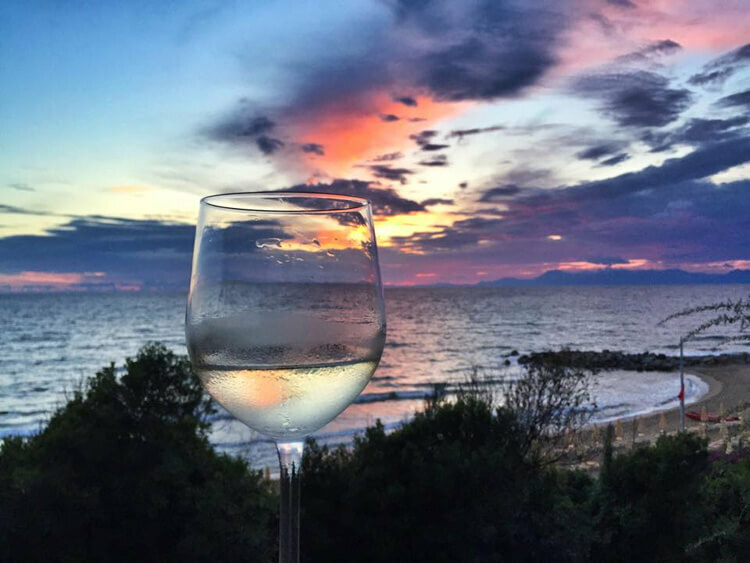 The Cilento Coast is one of the most unspoiled parts of the Campania region and it’s just two hours south of the chaos of Naples. Yet, this part of Italy is still hugely off the tourist radar. With hardly a blip about Cilento in the guide books, American and British travelers flock to the popular (and over-crowded, if you ask me) Amalfi Coast. 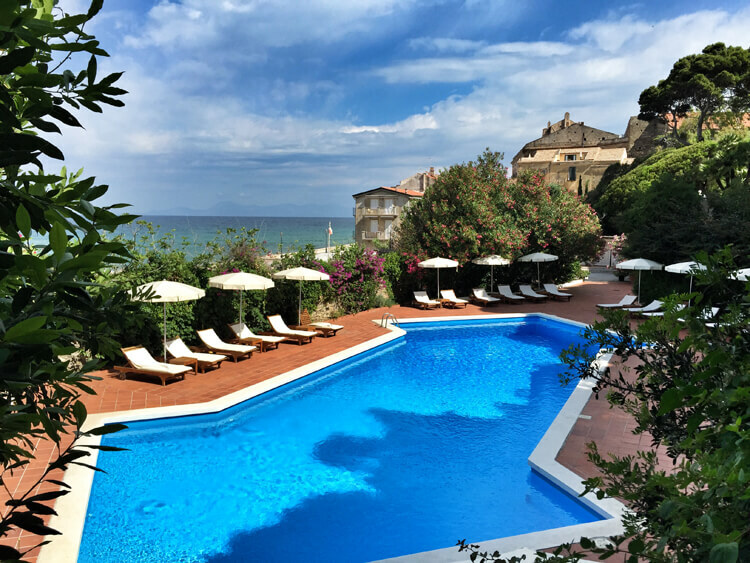 I once wrote why I thought Croatia’s Dalmatian Coast was better than the Amalfi Coast and once again, I found the Cilento Coast to be more my speed. You see, it’s not that I don’t agree that the Amalfi Coast is stunning. In fact, I adore Ravello. But to be honest, I find it a bit boring. Long a retreat for the chic Italians to holiday and stay cooler than in cities like Rome when the temperatures soar, the Amalfi Coast has kept its traditional Italian seaside retreat vibe. The whole point of a holiday there is to sit on the (mostly) rocky beaches, then indulge in a long lunch, shop, have an apertivo and then indulge in another long dinner. Open some kayak or stand-up paddle boarding rental shops and I’ll likely be singing a different tune. The people of the Cilento seemed to be a bit more like the coast itself: wild and rugged. 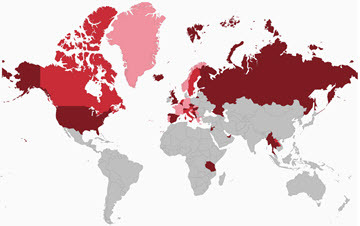 Here is where the Italian adventurers have been hiding, or rather, flocking each summer. But in true Italian fashion, even the adventurers can appreciate the finer things in life. 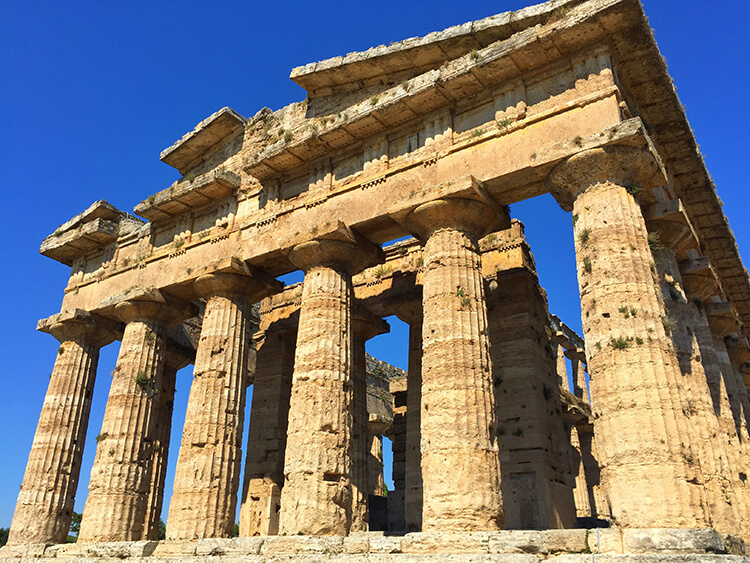 Less than one hour from Salerno, Paestum is home to some of the best preserved ancient Greek temples in the world. Paestum is also home to a cluster of buffalo farms that produce Italy’s best mozzarella di bufala. Wait. What? Greek temples and buffalo? 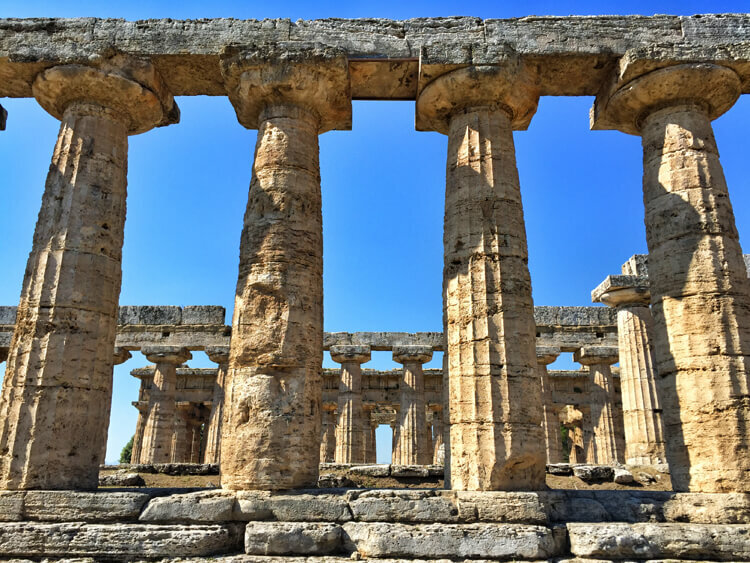 Paestum was founded by the Greek Achaeans around 600BC under the original name Poseidonia. It became Paestum in 273BC after the Graeco-Italian Poseidonians sided with the loser, Pyrrhus, in war against the Romans. It was a major ancient Greek city with a system of roads, temples and defensive walls. Today, the most notable features of the archeological site are the three extremely well preserved templates that have been excavated. The buffalo haven’t been around quite as long as the Greek temples and it isn’t exactly known how they got here. Some say that the buffalo were brought to Sicily from Egypt; others say that the Goths brought them. Either way, they’ve been around for many centuries. You might be surprised to know that the buffalo are actually water buffalo that can be found wallowing in swimming holes in Asia. They aren’t the big bison we have in the US. It also wasn’t until the 18th century that their fatty, rich milk was turned in to cheese. Since the milk is too fatty and rich to drink like cow’s milk, it’s perfect for making the creamy mozzarella di bufala. Mozzarella di bufala doesn’t get any fresher than this! Buffalo mozzarella is made from the unpasteurized buffalo milk and has a shelf life of about 4 – 5 days. 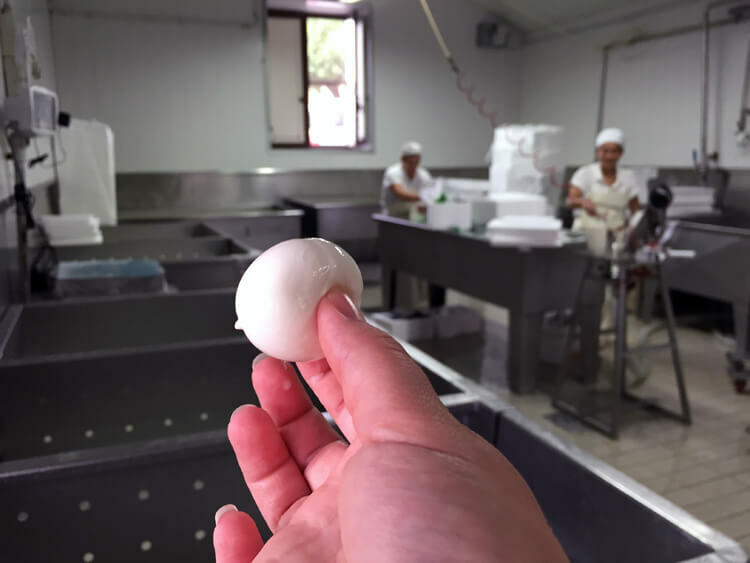 Though I can pick it up at any grocery store here in Italy, I’ve never tasted a little ball of mozzarella as good as when I visited the Barlotti farm in Paestum. It’s best to visit the farms in the early afternoon so that you can purchase that day’s freshly made mozzarella di bufala. The unpasteurized milk is allowed to ferment for about three hours. It is then chopped in to pieces and covered in boiling water. A machine forms the tiny balls of mozzarella. Sometimes the pieces are even braided, as one of the workers showed us. 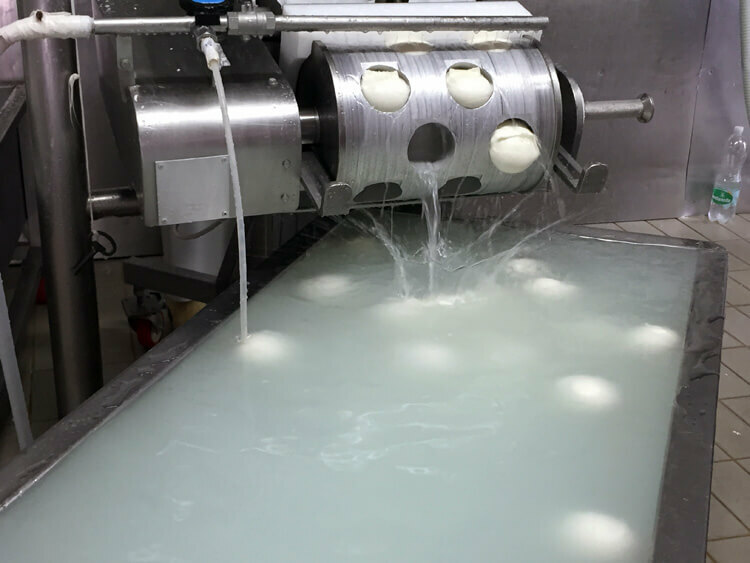 The balls of mozzarella get a salt water was and then are returned to their whey, which the liquid they soak in to keep moist when you buy a container or bag from the store. 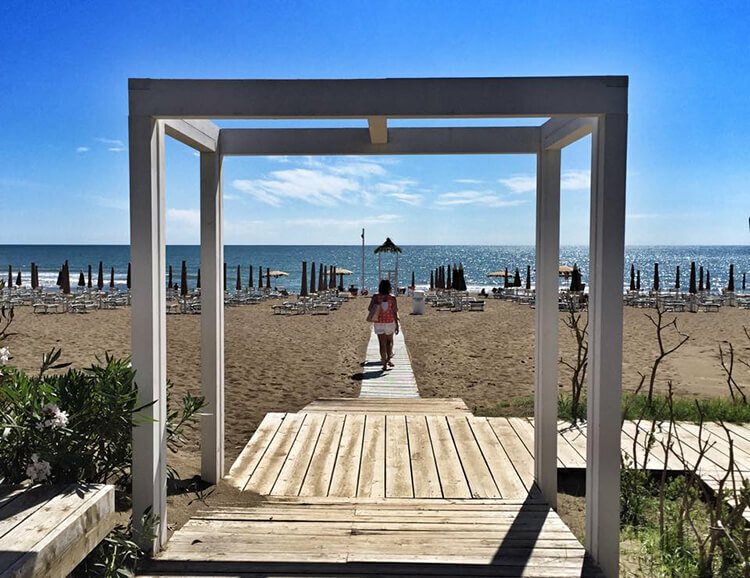 Aside from stunning Greek temples and delicious mozzarella di bufala, Paestum also has miles of beautiful white sand beaches. And unlike the Amalfi Coast where nearly every sunbed was occupied even mid-week, there were barely a handful of people on the beach. 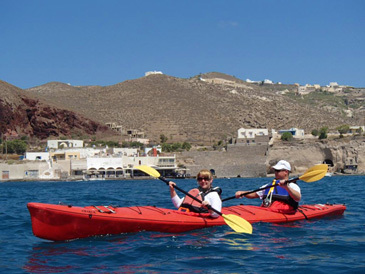 The Oleandri Resort is just a few minutes drive from the archeological site and has a private beach for guests. They also have a restaurant and we enjoyed lunch there. 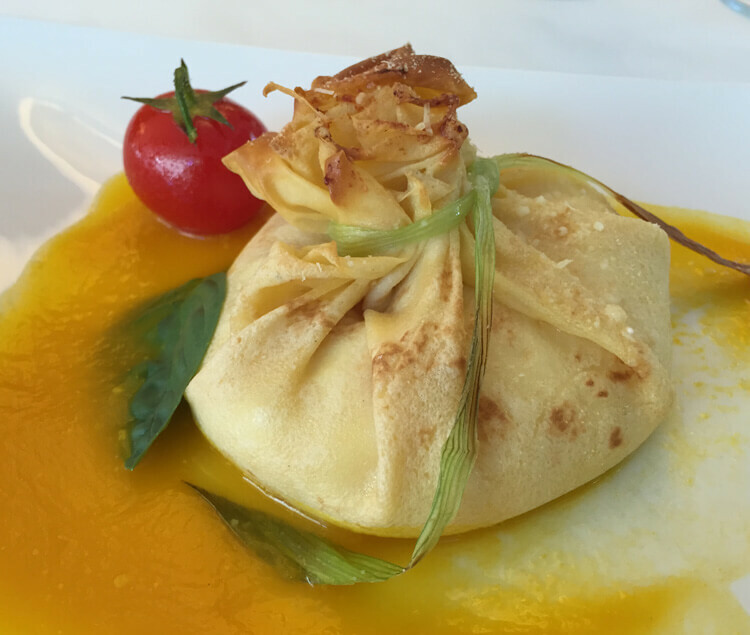 The pastry filled with mozzarella di bufala and ricotta with a pumpkin sauce is a must try. 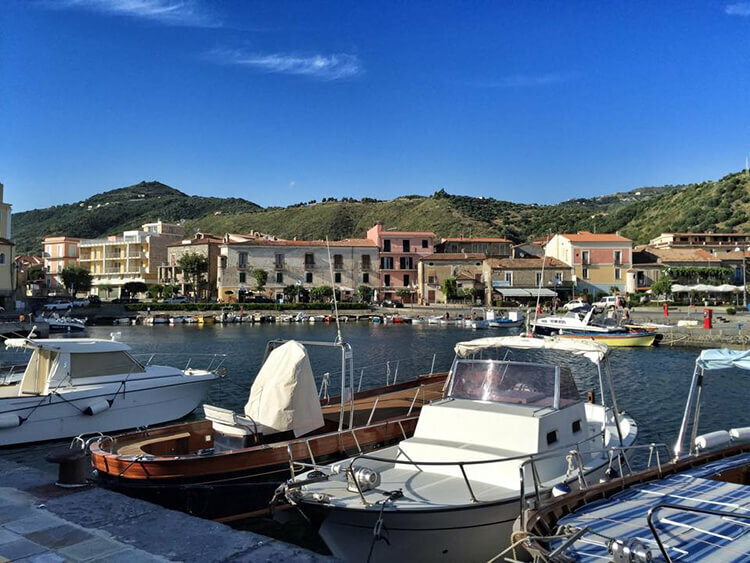 We travel a little further south down the Cilento Coast to the village of Santa Maria di Castellabate. Not only does the village have a sandy beach steps away from its center, it also has its very own prince in residence, Angelo di Belmonte, who lives in the 17th-century Palazzo Belmonte. Lucky for me, Palazzo Belmonte is also a luxury hotel. It has a few suites in the oldest part of the castle and more modern rooms in an annex building above the gardens. I felt like a princess as I climbed up the stairs to my suite in the castle. Imagine my surprise as the phone rang and I answered to be told that Prince Belmonte himself was waiting in the garden to have an apertivo with us. Over a glass of wine and with a view of the stunning sunset, I learned a bit about the palazzo’s history and the Prince’s vision for his guests to enjoy this little slice of paradise. Though in a small village far away from the tourist services of the Amalfi Coast like ferries, Palazzo Belmonte can arrange boats to take guests directly from the palazzo to Capri or the Amalfi Coast. Heading even further south along the Cilento Coast, we came to the village of Acciaroli. The tiny fishing village was a favorite of Hemingway, who came here in 1952 after he’d finished writing “The Old Man and the Sea”. Hemingway would spend hours in the bars along the seaside promenade. The village is small and there isn’t much to do but wander the little shops like the shoemaker who makes custom shoes for you or the handcrafted pottery shop. It is charming though and worth a few hours to explore, perhaps relaxing on the seaside promenade with a spritz Aperol or having a lunch of fresh fish. Even further south in Palinuro the coastline is rugged and riddled with sea caves. This is Italy’s most extensive cave system and divers flock to explore the underwater cave network. Well, mainly Italian divers. 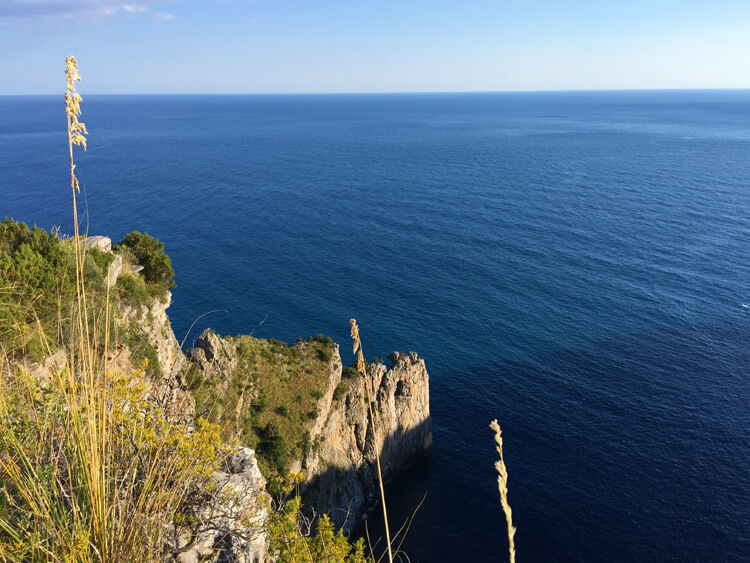 Capri’s famous (and packed) Blue Grotto isn’t the only place to see water so blue that it takes your breath away. 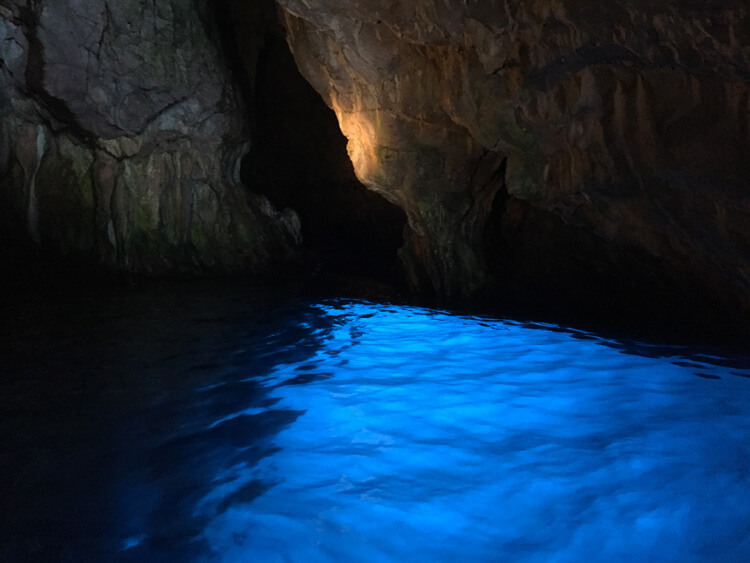 The Cape of Palinuro has a cave by the same name and the water is illuminated from below. From Palinuro’s port, you can hire little boats to take you out along the peninsula to five of the sea caves and our boat was the only one there. Unfortunately, the sea was rough on the day I went out and we weren’t able to visit to the other caves. I was looking forward to seeing the Blood Cave, where a red algae makes the cave walls appear that they are dripping blood. 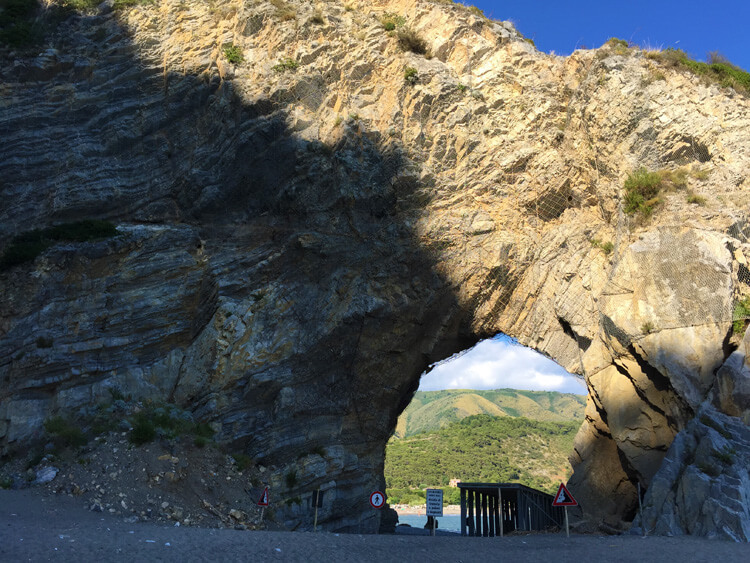 The Natural Arch is one of Cilento National Park’s most important natural monuments. Unfortunately, heavy rains and natural erosion caused a partial collapse on the upper facade back in 2007. The netting has been put in place along with safety measures such as the passage so that people can still enjoy its beauty. But go soon because geologists predict that there is no halting the natural destruction of the arch. The Cilento and Vallo di Diano National Park of Palinuro is a haven for rock climbers and hikers. There are many hiking trails, including coastal paths that hug the rugged sea cliffs. Not only can you see stunning sea views, there are many interesting watch towers that stand in various stages of ruins. You can even find a lighthouse or two. Check the Park website for recommended itineraries. Naples is the closest airport to the Cilento Coast. The regional trains do run along the coast to Castellabate, Paestum and Palinuro. Check Trenitalia for time tables. A car is highly recommended for traveling the Cilento Coast and I recommend Carrentals.co.uk. Rooms at Palazzo Belmonte start at €238 per night for a double room mid-season. Rooms at Oleandri Resort Paestum start at €167 per night for a double room. Rooms at Grand Hotel San Pietro Palinuro start at €139 per night for a double sea view room. This #SalernoC2C Amalfi and Cilento Coast trip was provided by the Confesercenti Provinciale di Salerno in partnership with To Salerno in order to bring you this story. However, Luxe Adventure Traveler maintains full editorial control of the content published on this site. As always, all thoughts, opinions, and enthusiasm for travel are entirely our own. This article contains affiliate links. When you book on Booking.com through our affiliate site, we earn a small commission at no additional cost to you. Beautiful area! You really take beautiful photos of the scenery and food! Oh my gosh, how I miss fresh mozzarella! Thank you for sharing this secret with me/the blogosphere. I would love to get back to Italy someday soon, and the Cilento Coast has just rocketed to the top of my list. My husband is Italian and he’s never been to Italy – it’s on our bucket list!! Love these gorgeous photos! Positively stunning!! And I love your peek inside the mozzarella factory, how fun! Gorgeous photos (on my bucket list – obviously!) and thanks so much for sharing your experience! So amazingly beautiful!! And that cheese?? I die! What an epic adventure – I love places off the beaten path – and this defeintely would be more my speed than the typical packed tourist routes. That mozzarella—>!!!!!!!!!!! I need Italy in my life! I’m bookmarking this for our next trip to Italy. We’ve spent most our time in Rome and Florence and I would love to explore this area. It looks absolutely beautiful. I love the photos of the temples. Who knew about the buffalo there?! The balls dropping in the water look so cool. The secret is out! This is amazing! I hate flocks of people! Would there be any hostels in this area? Hi Gina, we don’t stay in hostels so certainly aren’t experts on them. I would think that you would be able to find them though. I’d check a hostel booking site like Hostelworld and search for cities like Agropoli and Paestum.